So I’ve been to Butler’s Pantry twice now, and before I launch into a critical review, I want to say in fairness that the food is mostly pretty good (minus the fact that their hash browns are inexplicably like the kind they make at McDonalds). It’s made fresh to order, there are some light & tasty selections, and the portions are good. Also, it’s nice to be able to go out for brunch on a weekend in wintertime and not have to stand out in the freezing cold in a line for an hour. That being said, I can’t say the food is outstanding and on both occasions the service has been less than impressive. On my last visit I had a particularly rough go. Our server wasn’t overly friendly to start with: she had that borderline-pleasant-but-I-kind-of-seem-like-I-don’t-want-to-interact-with-you air. (You know- when someone asks if the soup is any good, she looks at them blankly and says “Well, yeah”.) Things only went downhill from there. Our food took FOREVER to arrive, despite the fact that the restaurant wasn’t full, there were only 6 of us, and we didn’t order anything crazy. 4 plates of food came at about the 45 minute mark, at which point the server apologized because “the kitchen was really backed up”. A good fifteen minutes later, my eggs benedict arrived (along with the other dish which was eggs, sausage, and toast). And it was STONE COLD. I don’t mean it was lukewarm or under temperature. 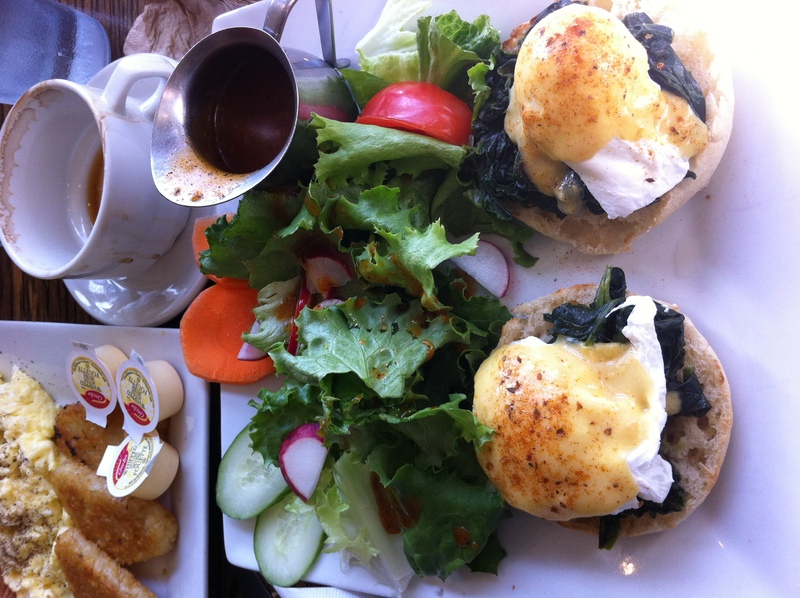 It was literally a cold English muffin topped with cold sauteed spinach topped with a cold egg topped with cold hollandaise sauce: gross, right? It looked good...but it didn't taste good. I hate complaining at restaurants. But when I sit for an hour waiting for a $10 breakfast that comes out cold, I don’t really have a choice. I debated on my “desired outcome” with the members of my party for a few minutes, trying to fight my rising anxiety about having to interact in a negative way with our awkward waitress. Fortunately, she wasn’t weird when I told her I wasn’t comfortable paying, and she said that “since the rush was over” the chef could make me up something quick. I declined. Am I wrong to think that this did not constitute adequate service? Personally, I think the status of our really late food would have benefitted from some server attention in the first place- maybe a check-in at the 30 minute mark or an offer of a beverage (ideally complimentary) or a snack? That aside, the fact that we waited forever and then got incredibly substandard food that required an awkward conversation just to get the item taken off the bill was extra unfortunate. Anyways, the icing on the cake was when everyone went to pay and our waitress informed us that in addition to the kitchen being slow, the debit/credit machine really was acting up and they were only accepting cash. Of course, no one had cash and no one appreciated the lack of advanced warning. When we asked where the nearest ATM was, she looked at us like we all had three heads and disparagingly told us we could try walking up the street. I tried to like Butler’s Pantry, I really did. The food has good potential and the quiet, cozy, diner-like atmosphere is not a bad place to spend a Sunday morning. But the service just ruined it for me. And with a million restaurants in Toronto vying for my breakfast dollar, I don’t think I’ll be back if I can help it. This entry was posted in Breakfast/Brunch, Dine Under $50 and tagged eggs benedict, french toast, scones, soup. Bookmark the permalink.